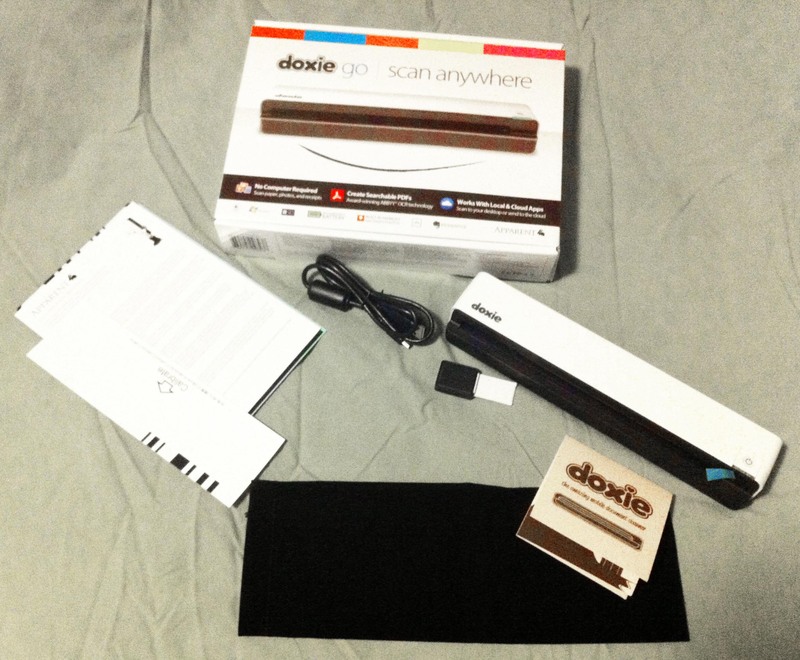 Bottom Line: The Doxie Go is an ultra-portable scanner that fits in a student’s budget — and in their backpack. I can’t stand getting mail these days. Packages are okay, I still get excited when the UPS man knocks in my door. Personal letters are great, too — there’s nothing like getting a handwritten, personalized letter. All other paper mail should be abolished, and I imagine it will be, over time. Unfortunately, the world is not this way (yet), and I still have to deal with physical documents ranging from trivial junk mail and shopping receipts to moderately important paper bills to extremely important confirmation papers for school. For a couple of years now, I’ve been hooking up my MacBook to my trusty old flatbed scanner/printer combo, scanning the documents, then running them through OCR software, then tagging them. Lately, I’ve been looking at options to streamline this process. One of the popular scanners that I’ve looked at is the Doxie Go. A few of the things at appeal to me are the the small size (fitting for my humble med student abode), wireless functionality, integration with 3rd party storage apps like Evernote, and built in OCR. I requested a review unit from Doxie, which they graciously sent along with a return label to make it easy to return after my unspecified evaluation period. It would be remiss of me not to mention that I have now had the unit for months longer than I’d originally intended, and Doxie has not once bugged me about it. Thank you, Doxie. I’ll also be publishing a second review on the SMRT Blog in the next few days that is a touch more medical student centered. The scanner came packaged in an appealing box along with a carrying case and a few other items as you can see below. They have obviously put lots of thought and care into putting together a package that arrives with a bit of personality. As you can see, there’s the scanner, a USB cable, a small “cleaner” tool (small black square with a white tag), the manuals and other paperwork, and a nice little carrying case. Basically, the Doxie Go is an ultra-portable single-sided scanner. Its diminutive size is one of the most striking features: 10.5” x 1.7” x 2.2” (26.7 cm x 4.35 cm x 5.6 cm) according to the official Doxie site. It has a built-in, rechargeable battery that boasts about 100 scans per charge. To be honest, I didn’t have the patience to go through a hundred scans to test this claim, but battery life was really never a problem. It scans at either 300 or 600 dpi; the 300 was more than adequate for most tasks like receipts or documents, but it’s nice to have the higher resolution option for photos. It can use USB storage, SD card storage, or its internal storage (unspecified amount but they claim 600 pages worth). It can also utilize WiFi-enabled SD cards, which can apparently allow the Go to scan directly to the cloud. I did not test this feature and can’t speak for how well it works, as I don’t have a WiFi enabled SD card… but it sounds awesome. You can purchase the Doxie Go at the official Doxie site for $199. I’ve tried to make the above portion somewhat objective, but I imagine that by now you’ve sensed my enthusiasm for some of the Go’s features. For one, it really is tiny. If you wanted to bring it with you to class, it would easily fit in a backpack or large purse. If you want a scanner in your office or cubicle, it would be a great way to free up some desk space. On one hand, it doesn’t really make intuitive sense to me why cordless operation is so handy in a scanner. I mean, it’s almost always sitting on some kind of relatively stable platform like a desk, and I rarely need to scan something when I’m painfully far away from an outlet. However, I do find it handy to be able to slip the diminutive Doxie Go into a convenient hideaway spot to keep my desk free clutter-free, and when I do need it I can just pull it out and scan without tangled cords knocking over my coffee mug. No shuffling around outlets to make room. Just turn it on and scan. The scanning speed is pretty good. It’s not instantaneous, and if you scan several sheets in rapid succession you might have to give it a second or two before it’s ready for another, but overall I was impressed that such a small unit could scan in 8.5×11 sheets at about 8 seconds per page. Here’s a quick video so you can see what 8 seconds per page looks like. The Doxie scanning software actually does a great job. I have it set to launch automatically when I insert the SD card that I use with the Doxie. It is user friendly and helps the user painlessly delete unneeded scans, “staple” together multi-page documents, and export the product to numerous popular apps like Evernote, Dropbox, CloudApp, iPhoto, and more. You can set preferences for the default filetypes to export, and it will even OCR the .pdf files for you — I consider that an immensely useful feature. When you’re all finished, it prompts you to delete the images to free up space. As a side note, you can also just connect up with the supplied USB cable. I just prefer the SD card method so I can keep the cords stowed away as much as possible. I was entirely satisfied with the result of my scans. I used it almost exclusively for documents and receipts, which turned out great. If you’re a photographer looking to digitize images, I’d recommend you get someone else’s opinion, but to my un-calibrated eyeballs, the scans looked just fine. There’s not much else to say abut this, except that it’s a feature that my old flatbed scanner can’t do, so I thought it was nifty. With all the things that I liked about the Doxie Go, there were a few areas that could be improved. Keep in mind that some of these are trivial, and others might be nearly impossible to implement into such a small machine without a dramatically higher cost. This might actually be my biggest complaint against the Go. It scans wonderfully when unplugged but just doesn’t scan when plugged in. As an example of this issue, it comes with an uncharged battery, which means that after you hastily tear apart their carefully designed packaging and greedily go to scan your first page… you’ll find that you have to wait until after you’ve charged it up to play. While that’s not too big of a deal, it was an issue a couple of times when I was in a rush and tried to quickly scan something in before heading out the door, only to find that the battery was dead. The best I could do in these cases was to charge for a few minutes, unplug, scan, then plug back in. Luckily, the battery life is good enough that this was rarely an issue. While most of the paperwork I scan was a breeze, I had a rough time getting wrinkled or folded documents to load through the scanner. Often they would have one side of the document grab while another slipped, rotating the document, and leading to an unreadable, blurry portion of the resulting image. I mainly ran into this issue when scanning receipts that I had folded or crumbled when sticking them in my pockets, which I sometimes had to make several attempts before they would run through the scanner straight. Self explanatory. Note that these are features I’d love to see in my ideal scanner, but I hardly expect them in something as small as the Doxie Go. Also, keep in mind that many scanners with these features are double (or more) the price. The Doxie Go is a pretty sweet little scanner. It gets the job done for 99% of what I need scanned, and it does it at an affordable price and without crowding my humble room. To me, the best part about it is that it’s just so hassle free. No cords, it fits almost anywhere I want to stow it, it’s there and scanning in seconds when I need it.